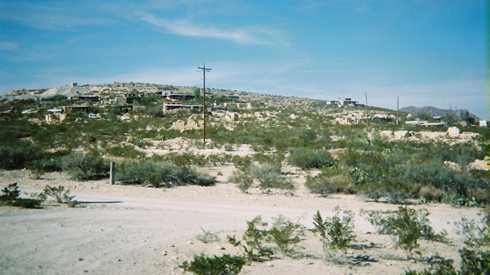 Terlingua is a town resolutely opposed to any inclination towards modernization. It is a place that offers few outward indications of its reluctant progression into the 21st century: the post office, with its dark brick walls and smoked glass, is clearly a recent addition to the landscape; the gas stations advertise $2.20 a gallon prices. Wait, I have that wrong. Suggesting that Terlingua has more then one gas station is incorrect. There is another however, it is 5 miles down the highway, 5 miles closer to the dark silhouettes of Mexico's mountains, in Terlingua's sister village, Study Butte. The only other stations are either 80 miles north in Alpine or 95 miles northwest in Marathon. My wife and I left Austin for Terlingua the first weekend of November, the same weekend as the International Chili Cook-Off. Leaving Travis county and work behind, we made Interstate 10 by suppertime. Somehow, I am always amazed at the beauty of the countryside between the Hill Country and the Big Bend. You would think I might be used to it by now, having driven the route several times in the last few years. You also might think that I'd remember never seeing a bit of it driving I-10 west by night. The highway has no lights and indeed, seems, at times, to roll out only directly in front as you approach any particular stretch. Only the oases of Sonora and Ozona present any illumination. Not until Fort Stockton is found, around eight black hours and two red eyes later, are there direct roads extending to the Big Bend. These are a couple of two-lane, Texas blacktops that reach Terlingua and, not too much further, the Mexican border. However, they stretch through a desolate and untamed countryside that intimidates with its enormity and silence. Still, it is a comfort to nestle into this pocket where Texas rests its giant elbow on the Sierra Madres. Ten miles north of Terlingua is a weathered motel named the Longhorn Ranch. Each room has two bottles of spring water on the table when you arrive. The water is left not as an amenity, but as a necessity. A sign on the bathroom mirror warns (in both English and Spanish) that the tap water is not potable and should not be consumed. Alongside this sign, another warns against "prolonged showers" or allowing "children [to play] in the tub" because the water supply is a "precious commodity." I can only guess at the glee some children would take in these signs, finally having the verification that baths are inherently wrong and a tooth brushing might be, in fact, hurting someone somewhere. Nevertheless, the motel is clean, comfortable, and has a built in restaurant. Your only obligation as a guest, aside from paying the bill promptly, is to throw the ball a few times for the property's dog, a black and white collie. The dog is tireless but harmless, and even his owner describes him as a "perro loco." This year, the 40th anniversary of the chili cook-off, my wife and I decided to travel a little further west in an attempt to find the Terlingua that draws only the soft-spoken and reclusive. It was a short drive, somewhere between the two chili events (Yes, there are TWO cook-offs. Evidently, some time ago, a schism occurred that would make even the Lutherans nod with understanding) to the ghost town of Terlingua. Terlingua is divided into three parts which can all be seen from the junction of Texas Highways 118 and 170. The demi-modern gas station/convenience store and hotel stand at the intersection. Across from these lie the single-story, sun-toasted buildings that comprise the majority of the town. These structures, which appear to have been fashioned from the same materials and hand, are dispersed around the landscape in a schizoid manner; each seeming to understand the need for neighborhood while simultaneously holding each other at arm's length. At a distance from this, the "ghost-town" sleeps on a small hill, an archaeological site in appearance. It is an odd assortment of homes built around, or sometimes inside of, the shells of stone houses dating to the early twentieth century, when the mercury mines were functional and the workers lived where they worked. 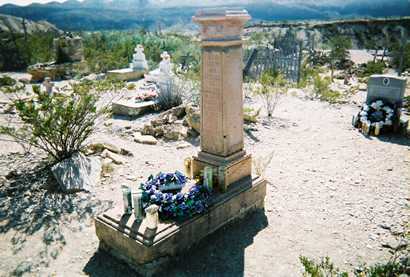 Ominously, the cemetery for these same workers and their families lies at the entrance to this section of town, a morbid reminder of the fetid conditions of life in Terlingua at the turn of the twentieth century. Although still used by the residents today, the cemetery is crowded with stones and crosses recalling the dangers of quicksilver mining and the influenza epidemic of 1918. November 2nd is the "Dia de los Muertos," or Day of the Dead, commemoration and we had arrived on November 3rd. The cemetery was ornate with wilted flowers, charred candles of Saints, Mexican and Texan flags, and Mary icons. A decorated graveyard seemed an appropriate marker for the homes resting behind it. Once inside the chili cook-off (The smaller one, "behind the store." The other, the "cutthroat" competition down highway 170 a couple of miles, is larger but less colorful) my wife and I wandered from RV to RV sampling chili and drinking tepid diet coke and beer, respectively. We found a vendor selling pocket purses, machined stones, and other trinkets who said he lived just, "about a mile over there," although he never indicated which direction "there" might be. I asked how long he had lived in Terlingua. He answered that he had been there about a decade but seemed unsure about an exact number. I then asked what he thought of the stampede of people every year. He replied, with a shrug and grin that belied his response, that it was "good for business." I wondered out loud whether the locals attended the cook-off or, if not, what became of them while their town was overwhelmed by the crowds. His answer was that most residents "hole up in their houses" and, because the DPS is absolutely everywhere looking for DWI victims, most stay home "because their cars and trucks aren't exactly legal anyways." We left the event for the quieter parts of the country early in the afternoon to look for others wise enough to avoid the din of the "chili heads" and responsible enough to stay home. 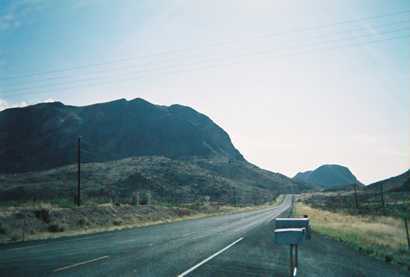 Driving Texas Highway 118 south towards Terlingua from the Longhorn Ranch Motel exposes an extraordinary landscape. The Chalk and Christmas mountains hem in the road between them and the base of the closer mountains sparkle white in the sunlight. They gleam as if dusted in snow. Every time we have driven this stretch of highway, I have marveled at the sight but never taken the time to discover the reason for what I presumed was an incongruity in the geology. This time, we drove further down 118 and found, at the very end of town, the rock shop of one Hans Luett. The sign in the window proclaimed that the store was open but, judging by the lack of cars and activity outside, maybe the notice was yesterday's forgotten chore. It seemed a distinct possibility. We left the car and tried the door. We were a bit surprised and apprehensive to find the door unlocked. As we entered, Mr. Luett stood behind the counter smiling broadly, and greeted us with a warm, "Good afternoon". He seemed to have been expecting us. His store was dusty, stockpiled with fragments of petrified wood, indigenous rocks, and crystals removed from their element but after so many years in this store they seemed at rest. After wandering around his shop for a few minutes, I finally asked Mr. Luett how long he had been a Terlingua resident. Evidently pleased at the prospect of conversation, he answered, "Twenty-eight years." He offered no more information. Intrigued by his accent, which seemed Scottish, I asked him where he was from. Mr. Luett responded that he had come from Nebraska, and when the look on my face displayed the proper amount of disbelief, he added "by way of Germany." I supposed that Herr Luett got a lot of mileage out of that one over his 28 years in Texas. I bought a brilliant chunk of petrified wood for my son and asked, finally, what caused the white sparkle in the mountains outside of town. Mr. Luett replied pithily, like a science teacher, "Calcite," then added, with a wink towards my wife, "Texas diamonds." The storefront of Ring Huggins lies about two hundred yards north of Luett's establishment. Every Terlinguan and every chili cook-off regular knows Mr. Huggins. Stopping by his store to purchase a potted cactus or piece of jewelry created from some local stone is as necessary when visiting Terlingua as queuing up at the sole gas pump when heading out. Sitting in a green metal chair outside his business among the cacti and other potted plants Mr. Huggins typified the attitude of many Terlinguans. He recounted, with a degree of loss and anger, how the world, even in the remote village of Terlingua had been affected by 9-11. He stated how this year he "had not made a single sale the entire month of September." Further, the Europeans who Mr. Huggins claims would spend a great deal of money on Texas stones and Mexican wares, have ceased traveling so far from home due to the "post 9-11 restrictions and high air fares." Additionally, Mr. Huggins recalled how, for generations, the Mexican villages that had existed just beyond sight on the other side of the river and sustained by their fraternal relationships with Terlingua, Study Butte and Lajitas have disappeared completely. Mexican workers who would walk over to work and then walk their wages back home have eloped to more accessible fields. He pointed down the highway and commented on how the one school in town has all but closed. The Mexican children who used to trudge across the border to attend school at first had trouble reaching their classes due to the new border restrictions then stopped the attempt altogether. Their families moved either deeper into Mexico or up to Midland /Odessa to become, in Mr. Huggin's words "real wetbacks" working the onion and melon fields of West Texas. The small community that had existed for years in an unofficial symbiotic relationship simply vanished. If you ever walked over to Paso Lajitas to have a beer or buy some hand-made souvenirs, you will notice that there is, literally, no sign of it today. Gone too are the Mexican vendors who would work their crafts at home and bring them to Terlingua to sell along the highway. Again, Mr. Huggins states that "The sense of community that existed for generations has been halted completely." An invisible enemy has changed the local standards forever. Cut off from their familial ties with Mexico, the residents of Terlingua are isolated today in a way that they have not been since the 1970's when the mercury mines were abandoned. Although you may see a FedEx truck making a delivery to the famous Starlight Caf� where the mineworkers used to enjoy cabaret shows, or you may run into Nathan Stevens who serves an unusually refreshing Thai meal at his Phat Caf�, the town is still a solitary fixture on the Texas landscape. However, The residents prefer the seclusion. In fact, that is the very reason most are there. Only during the annual chili cook-off does the area willingly accept any intrusion and even then it does so with not a little reluctance. However, the town seems to handle their annual invasion with aplomb. Mr. Huggins recounted how each year the local business journal prints an editorial about the chili cook-off. This editorial, in turn, lists the most outrageous reasons that the Department of Public Safety pulled someone over, presumably, to check for intoxication. Last year's winner was the man who was stopped for too many bugs on his windshield. To suggest that this part of Texas has avoided progress is a gross understatement. Signs of technological advancement are as scarce as ice. Modernity holds little truck here. Mr. Huggins's web-site is down and he is not sure what to do about it-he doesn't remember who is hosting the site. Mr. Steven's restaurant is open only a few days a week and Sunday is not one of them because " that would cut into [his] bloody Mary time." Terlingua has refused social and economic advancement as one would a flat beer. Nevertheless, it is exactly this insistence on isolation that is endearing to those of us who crave it yet, are too timid to endure it.